This Light Rail stop is located on a goods line built in 1912 to transport bulk cargoes to Darling Harbour for export. This Light Rail stop is located on a goods line built in 1912 to transport bulk cargoes to Darling Harbour for export. It includes a tunnel under Glebe with a spectacular viaduct at each end from which there are extensive views. 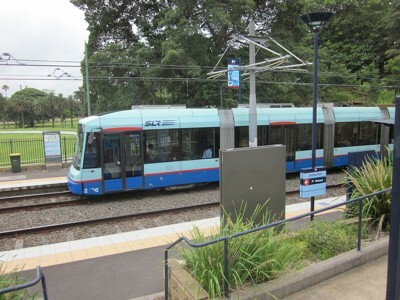 The conversion to Light Rail was the culmination of a nineteen-year campaign by The Glebe Society which began with the publication of the monograph Better Public Transport in Sydney’s Inner Western and South Eastern Suburbs written by Dr John Gerofi in 1981. This stop is at the end of the Glebe ridge. From the city-bound platform there are extensive views to the west and north. To the west you are looking across the Johnstons Creek Valley. From the left, the spires are those of the Witches Houses and The Abbey (John Young, 1881). West of the canal is Federal Park, which is the home of the Glebe Hockey Club, founded in 1931 and remarkable for including girls in its teams. It has been an important contributor to the health and welfare of the Glebe community through difficult economic times, and has produced two Olympians, Pat Nilan and Ken Wark. There is also a playground with barbeques and a picnic ground, and a brick pavilion. Jubilee (1909) and Bicentennial Parks lie to the east of the canal. Beyond these parks is Rozelle Bay, and on the northern shore Lilyfield and Rozelle.